CHANTILLY, VA-Founded in 1992, Audio Video Systems, Inc. (AVS), a provider of AV design-build and systems integration services for government and commercial customers, has outgrown several buildings over the years, most recently taking over additional space in the Chantilly, VA building it has called home for the last four years. As the company has grown, many of its employees have stayed along for the duration. "We have very low turnover here," said David Raden, chief technology officer for AVS, who holds the honor of being the third employee hired. Over 14 years the company has grown to employ 75 people. "A lot of the people have been here for quite a while. It helps with our overall quality, and makes everything go more smoothly." 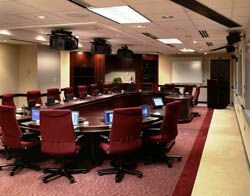 Long-term partner with the Pentagon Renovation program, AVS has been responsible for design and integration of communication and display systems for many Pentagon briefing facilities. Keeping the operation running on track is key for AVS, which specializes in large-scale cradle-to-grave AV projects such as command and control centers, network operations centers, briefing/display systems, and secure video-teleconferencing facilities that necessitate the utmost attention to detail. Being based in Virginia means that most of the major projects for AVS are government-based, requiring the highest level of standards. This concentration on quality has become imperative for the company, such that private sector clients receive the same level of service as the Pentagon. The AVS process involves, as Raden explained, getting to know the customer and what they need, not just what they think they want, then nurturing that relationship from the design process through the building stage, and then following through with maintenance for the lifetime of the system. Everything from concept, design, integration, test, installation, and life cycle maintenance is done in-house. This focus on being able to conceive, design, and build the entire project from the walls-in puts AVS in a unique position in the industry. "We really take the beginning-to-end process seriously," said Raden. "We try and do as much of the work in-house as possible, so we have total control of the quality. That's our specialty, and it's what we do best." While AVS does smaller, less intensive projects like one-time projector installations, its real forte and what it is known for are larger, more complex systems. The company focuses heavily on the technical side of the business, and has a strong team of engineers that receive specialized training in various aspects of the industry, such as master electricians and dedicated documentation specialists who write the manuals, test plans, and proposals. Furthermore, many employees have special security access that is often needed on government projects. "We've identified the need for access to places you can't go without clearances," explained Raden, "so we've pursued people with high-level security clearances when building up the staff." Since the terrorist attacks of September 11, there's been heightened focus on the being able to communicate, respond, and be ready for new disasters, leading to a greater amount of involvement for AVS in places such as the National Military Command Center's Continuity of Operations site, U.S Department of Homeland Security, CIA, FBI, and the White House. "This heightened focus on communicating and sharing information has driven the government to invest more heavily in their infrastructure and their capabilities that had not been improved for years," said Raden. While working to enhance and streamline command centers and network operations for the military, AVS, he continued, creates integrated AV systems solutions that allow people to easily collaborate and make decisions. "We don't generate the information, we don't make the decisions for them, but we do give our customers the tools they need to communicate mission critical information, get briefed, have a discussion, make a decision, and make it happen." An important element of that process is the tools. AVS can be counted on for its innovation when the tools it has to work with don't precisely fit the job at hand. One such solution it has developed is the AVSIM-530, its second-generation product that allows users to place secure and unclassified video teleconference calls through one codec and set of ISDN lines. The AVSIM-530 combines the functionality of its AVSIM-366 dial isolation module with the AVS-449 BYP bypass switch into a single rack unit, in remote-controllable format. The secure/non-secure switch in the AVSIM-530 provides the ability to place video teleconference calls over ISDN lines and switch an encryption device inline for classified communication. "It's beneficial because you don't need to double up on the equipment you're using," said Raden. Beyond the importance of gaining new clients, AVS emphasizes customer satisfaction by following through and having a contact available after the completion of a project. With a dedicated project management staff, clients can be assured that their projects are on track, on budget, and that they've got a contact who is concerned solely with their needs, and not working on sales and marketing at the same time. "Our strength is our people. We take the project management portion of the business very seriously, as a way to make any job we do successful," Raden concluded.